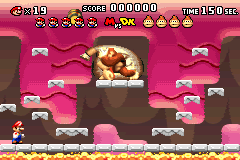 Level 3-DK is the eighth level of Fire Mountain in Mario vs. Donkey Kong, beginning immediately after the player completes Level 3-mm. The high score for this level is 18500. Like with other Donkey Kong boss levels, Donkey Kong has four lives and the amount of lives the player has is dependent on how many Mini Marios were collected in the previous level. If the player selects this stage from the level select screen, they will begin with four lives. Donkey Kong starts by tossing a barrel down the platforms, and he will continue tossing barrels and lava rocks either to the left, the right, or downward. The player needs to avoid these falling barrels and wait for one to stop rolling so they can pick it up. Barrels Donkey Kong throws downward will always land upright. While carrying a barrel, the player needs to jump up the platforms and throw the barrel at Donkey Kong when they are on one of the higher platforms. The player needs to attack Donkey Kong with barrels four times in order to move on. This page was last edited on April 14, 2019, at 15:47.